FAA compiles ATADS data for this facility. Airport operations in 2012 were DOWN 25% vs. 2007 operations, and DOWN 60% from the peak year (1990). …A Beech Kingair inbound from northern Tennessee approaches to the west of the airport, aligns for a Runway 16 landing, and impacts trees north of the airport, right next to the Foxboro Apartments. The accident happened around 8:27PM. …The pilot and copilot were killed when their air cargo learjet, flying empty to pick up a load at KPWK, cancelled IFR then crashed during a VFR approach. Tape recordings suggest that aircraft icing was a significant causal factor. …Local officials approved a Montessori school, but FAA then told the airport authority they were jeapordizing federal funding if they allowed construction. A campaign and lawsuits followed. The 3,000′ by 50′ runway was kept open for ‘safety’ (though, many will point out, there is not a lot that is safe about a 50′ wide runway). 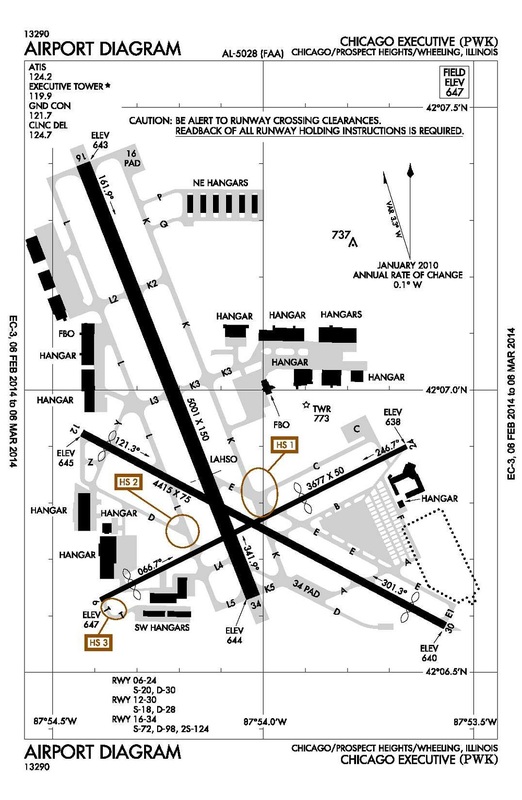 …The twin cessna inbound IFR executed an ILS approach to Runway 16, cancelled IFR to land Runway 34. Crashed 0.9-miles southwest of the airport. Many pilot reports of icing conditions.